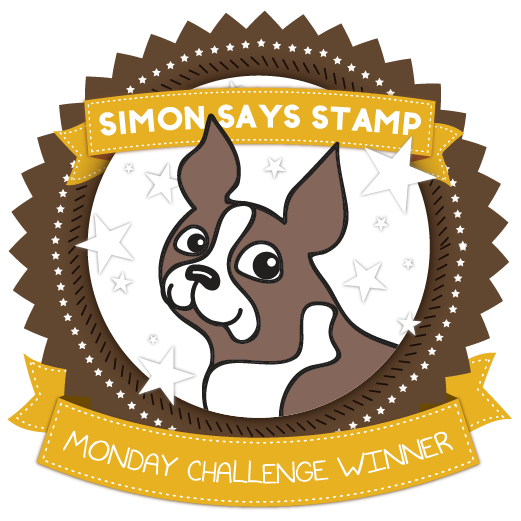 Thank you for joining us for the It’s A Wrap Challenge and we hope you will all join us again this week too. 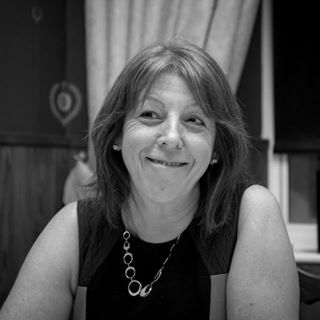 This week we are challenging you to choose a colour and stick to it! 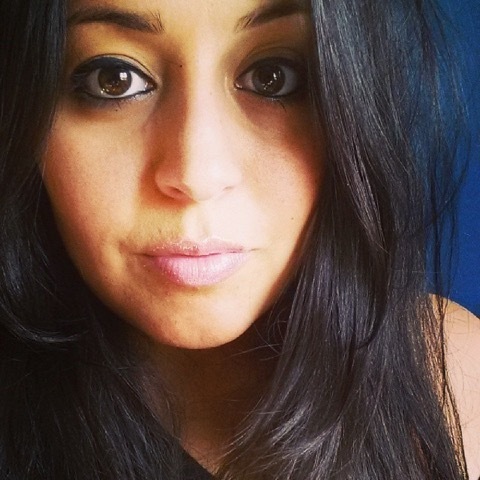 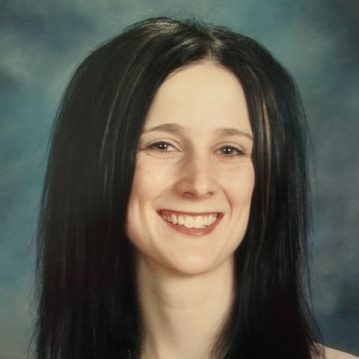 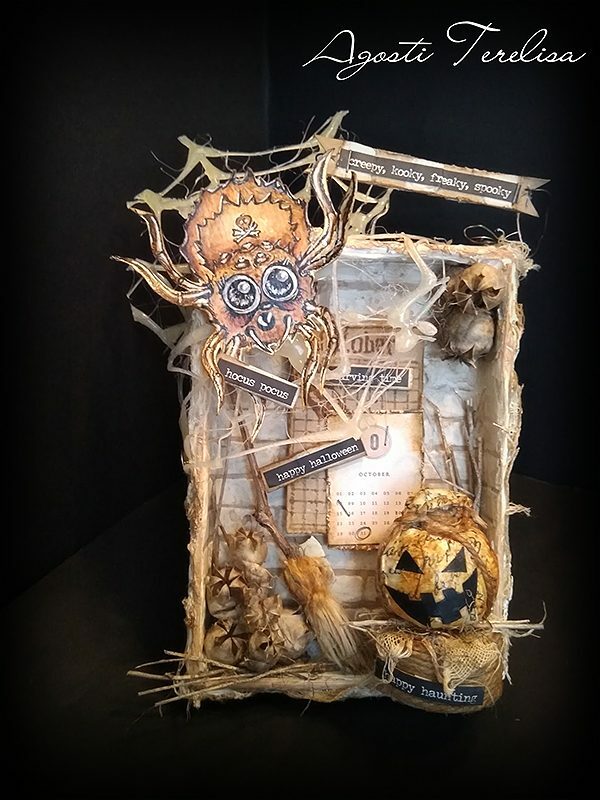 Terelisa was at first frightened by the idea of having to use only one color and its nuances … then she started to draw the spider and to color it with Distress Ink in various shades of brown, and after that her project was pure fun. 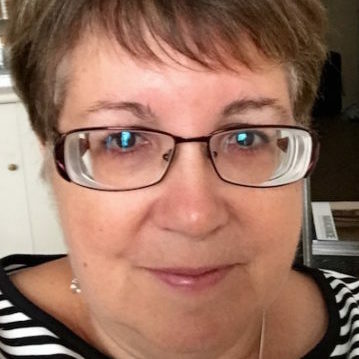 She created the cool spider web with wire and hot glue, and a nice broom to a little witch. 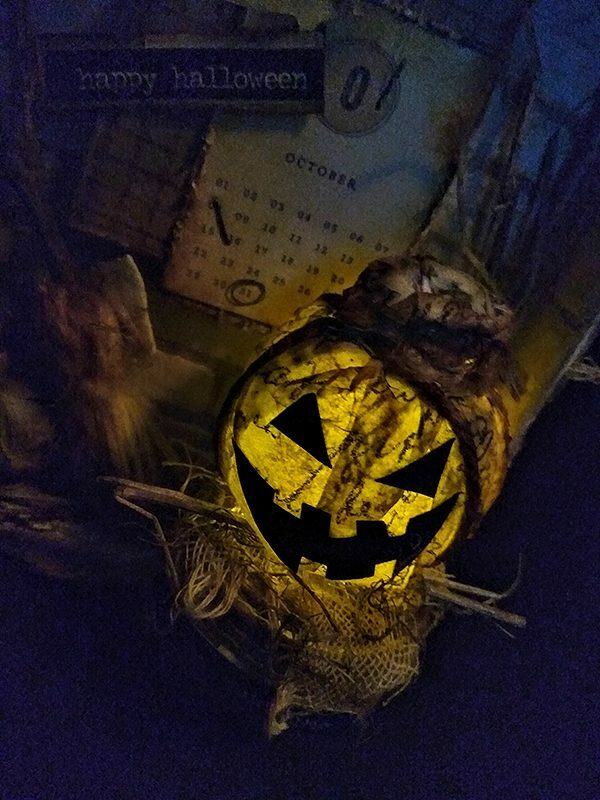 Halloween without an illuminated pumpkin is not Halloween and Terelisa created a pumpkin with a led light and a ping pong ball, covered in Tim Holtz tissue wrap. How clever! 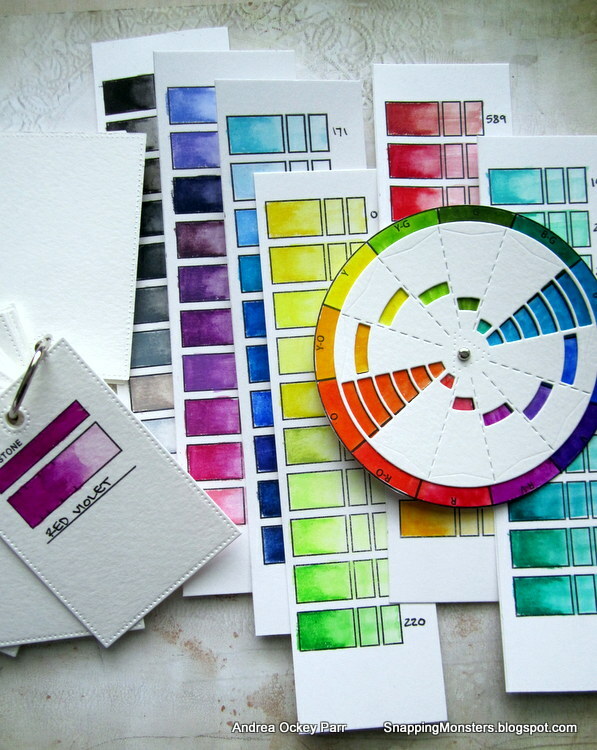 Andrea made a collection of monochrome color swatches to organize some her favorite watercolors and water-soluble crayons. 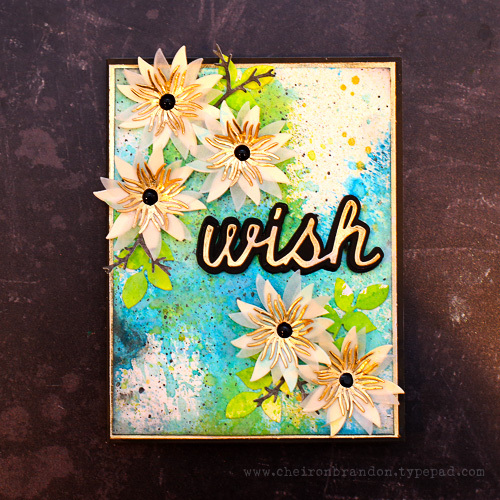 She used Waffle Flower’s Swatch Tag stamp and die combo pack, their Color Wheel stamp and die combo pack, and their Swatches stamp. 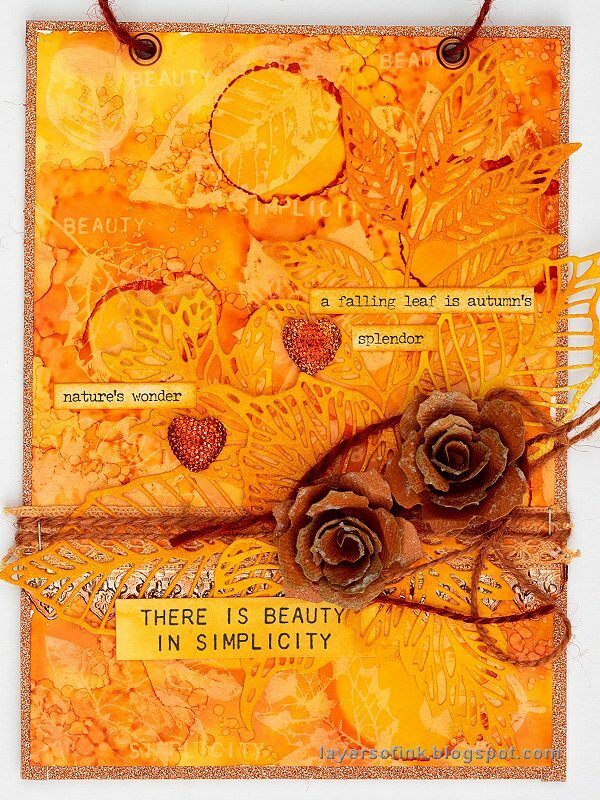 Anna-Karin went with orange this week and had such fun making an alcohol ink lift background, with ghost leaves stamped with Tim Holtz’s Nature’s Wonder set. The detailed leaves were die cut with Tim’s new Sizzix Skeleton Leaves Thinlits dies. 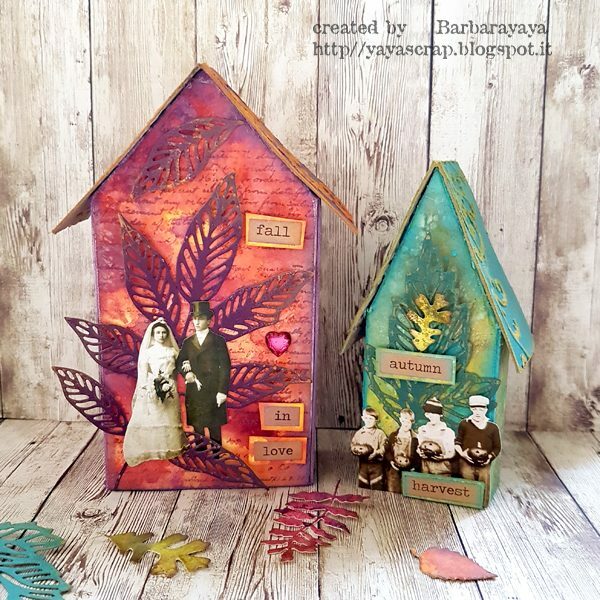 Barbara has been inspired by the autumn and its colors and has created two Tiny houses by Tim Holtz Sizzix. 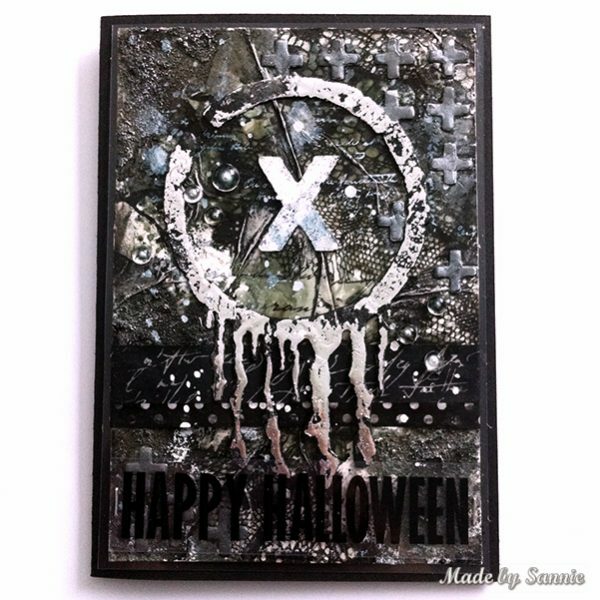 She’s added Skeleton leaves dies and Paper dolls and painted with Distress oxides. 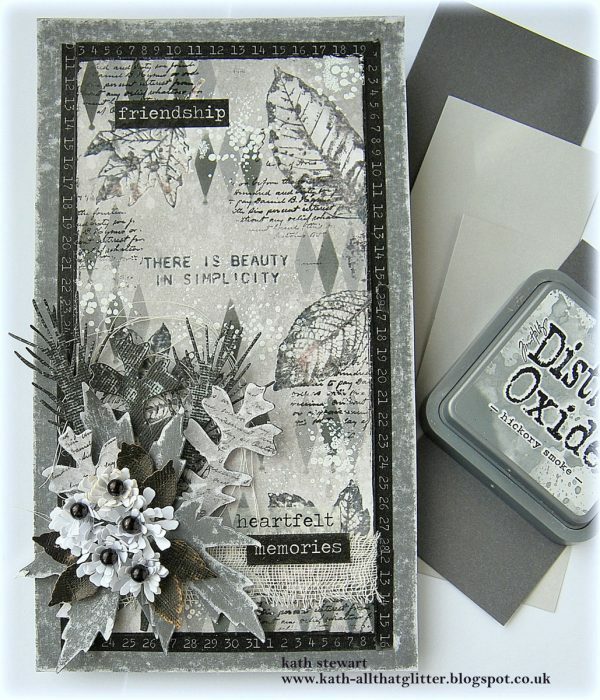 Cheiron created the monochrome background of her card with all her favorite blue-green Distress Inks and Oxides including Mermaid Lagoon, Peacock Feathers and Twisted Citron. 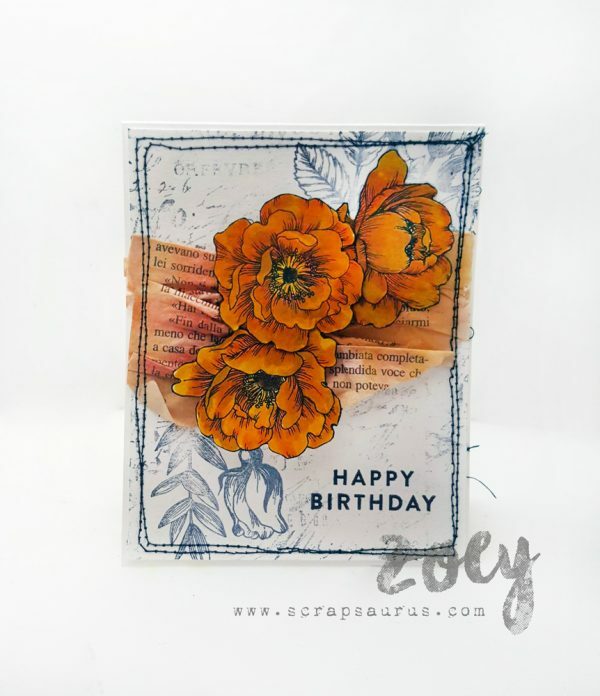 She added gorgeous blooms and stems from the Funky Floral 3 and Funky Foliage and a word from the Shadow Script 2 Sizzix Thinlit dies. 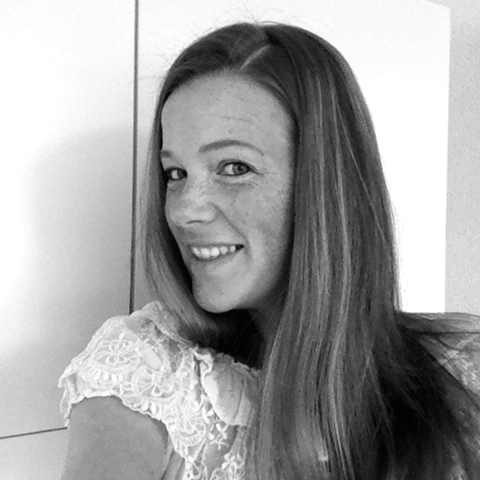 Emma created a monochrome panel using the classic combination of black and ivory. 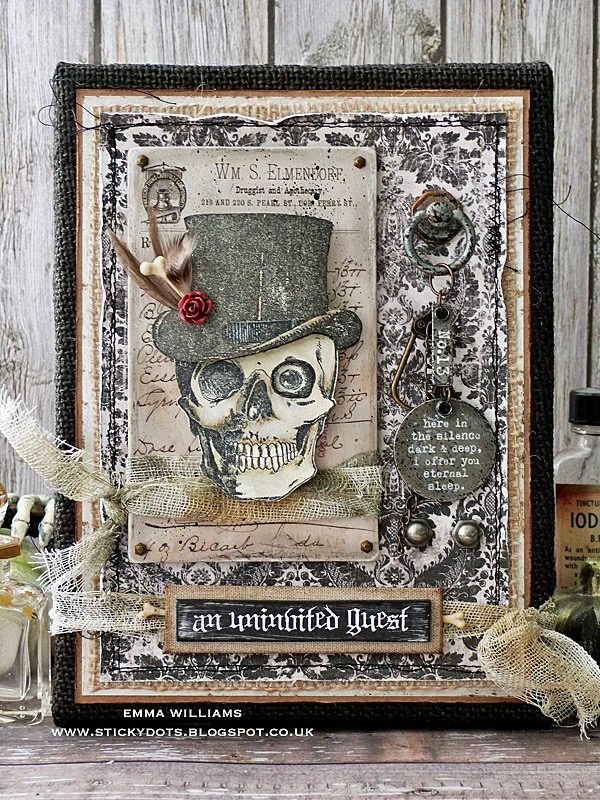 She used Halloween Worn Wallpaper as a background for her stamped image of the eccentric but oh-so spooky Mr Bones before adding idea-ology pieces, including a Halloween Quote Token and Quote Chip. 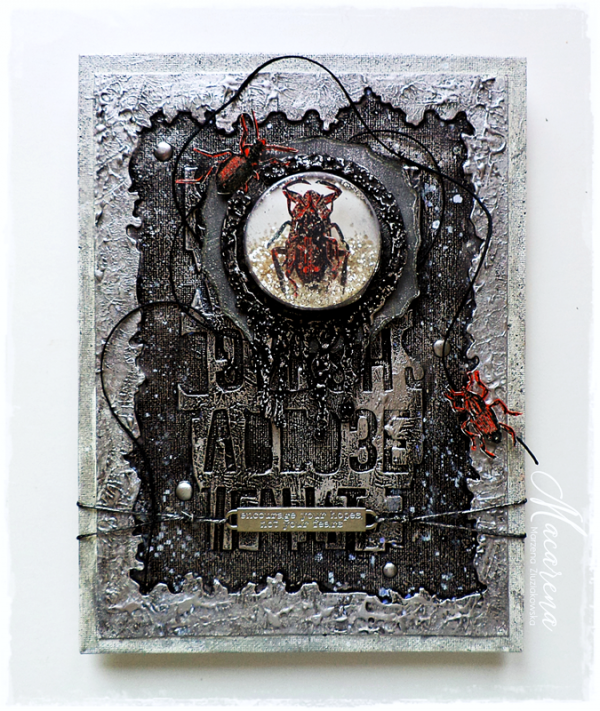 Macarena made a black/grey/silver canvas using leftovers of Tim Holtz Sizzix Ornate Frame#2 die and Tim Holtz Sizzix Alphanumeric Marquee die. 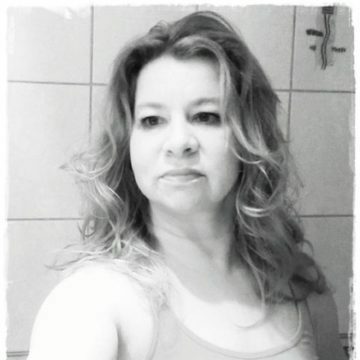 She used a lot of Dylusions Black Marble paint and highlighted the texture with Prima Old Silver Metallique Wax. 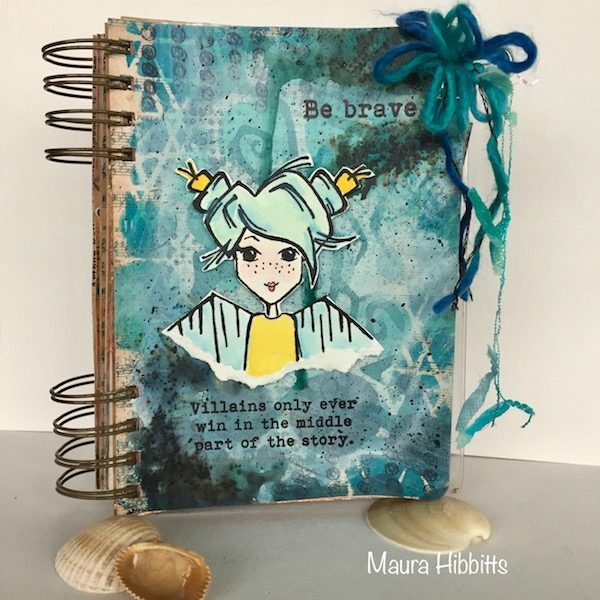 Maura headed off into the blue with Andrea Ockey Parr’s Brave and Good stamp set by Inky Antics, along with Simon Says Stamp’s Irregular Dot and Abstract Triangle stencils, and the Tim Holtz Twisted stencil. 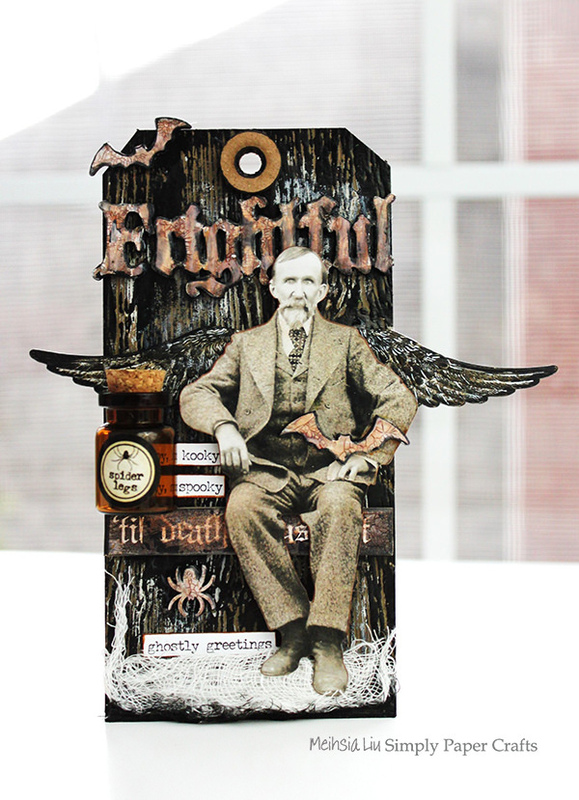 Meihsia was inspired to create a mixed media Halloween tag using Tim Holtz Sizzix Lumber 3D Texture Fades Embossing Folder on the backgound and decorated the tag with Idea-Ology Paper Dolls Ancestors Paperie. Love, love all of the design teams creations!